Today, Arla Foods and University of Copenhagen celebrate the renewal of a strategic framework agreement signed in 2011. The agreement consolidates a very strong relation and research collaboration within dairy process technology, ingredients, flavoring, nutrition and health. The agreement promotes creation of knowledge and new technology of benefit to future dairy production and to the Danish food industry in general. 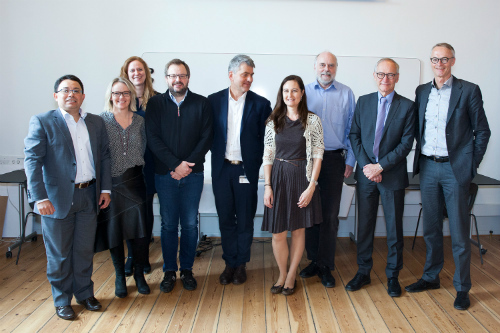 As a part of the renewed agreement, Arla Foods contributes with 5 million DKK, in the period from 2015 to 2018, for strategic activities to be carried out at the University of Copenhagen. 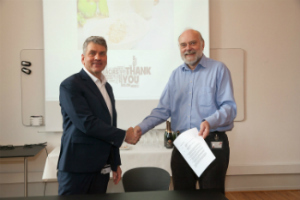 Among other things, the collaboration agreement includes support for a new professorship in Dairy Process Technology at Department of Food Science (FOOD) at University of Copenhagen. - Dairy Technology is a rapid developing area, and we see many possibilities for creating new production with lower water- and energy consumption as well as an improved utilization of raw materials. - We have established a very strong relation to Arla Foods, which both parts would like to consolidate. This is the reason for the renewal of the agreement today. Arla Foods is a strategic preferred partner for our University, because we share many core values, i.e. our focus on developing healthier foods, prevent lifestyle diseases, achieve sustainable production, food safety and education of qualified candidates, says John Renner Hansen. SVP R&D Sven Thormahlen from Arla Foods adds: "Arla is committed to its vision of creating the future of dairy, and we collaborate with the best academic partners around the world to bring new ideas from the cutting edge of science. Our partnership with University of Copenhagen will help us raise the bar on developing the next generation processing technologies to create new delighting products for our consumers. We’re confident that our contribution to this Dairy Processing Technology professorship, under professor Lilia Ahrné, will have great impact for Arla and the dairy community in Denmark in the immediate future’.